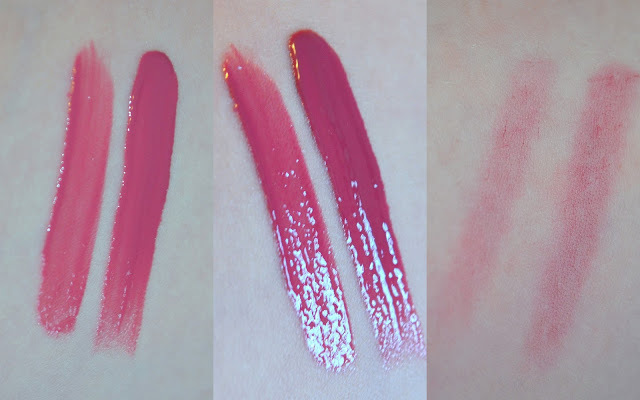 Missha seem to be slowly revamping their line - I noticed that after the release of the new Glam Flash Rouge their website no longer lists any lip glosses. Perhaps it's an oversight on my side, perhaps they are moving towards a new leaf in terms of packaging and product. I happen to pick up the two representatives of the new lineup at the very beginning, before they were even officially called Glam Flash Rouge - it was called Rouge Bless You. I think it was a last minute switch, since on the packaging everything is in order. That's where we're starting - packaging. From the boxes that house the products to the product casings we are talking classy, chic packaging through and through! Black with very subtle gold accents certainly looks luxurious - you wouldn't suspect they don't even cost 20$! The casing of the both the lipstick and the lip fluid is almond-shaped. I really like the aesthetics of this new release! 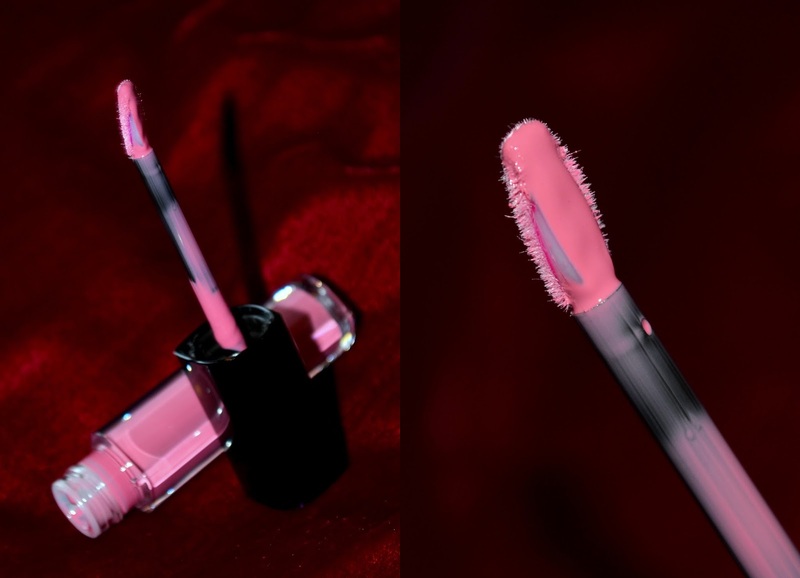 The lipstick is housed in a heavy-duty plastic tube that in no-way feels cheap! To be honest, Dior lipstick casings feel child-like compared to this. It has Missha's name engraved at the top, and a single gold rim - very classy. Overall, it's heavy, very well-made, extremely classy and simply luxurious to hold! It just looks so elegant and beautiful! It does have a faint floral scent - it's becoming quite the signature of Missha's lip products. It's not irritating, barely noticeable and I personally really enjoy it. Now let's see the swatches for my colour pick - Missha Glam Art Rouge Bless You in French Lavender. As you can see this is a stunning shade of violet. It's the only one of its kind that I own, and quite honestly I haven't seen this shade anywhere else! It's cool-toned, with a pink-ish hue to it. Intensity depends on how many layers you add - a single swipe will give you a bright, yet somewhat subdued shade, while two layers will turn it into a bold statement! The formula is divine - smooth, creamy and moisturizing. There's no gloss, but it glistens due to its creamy formula - I simply adore it. It also has a good staying power - it lasts 4 hours with both food and drink, and leaves behind a lovely stain. Being cool-toned it makes your teeth look whiter, and it also casts a violet hue across the face, I feel! 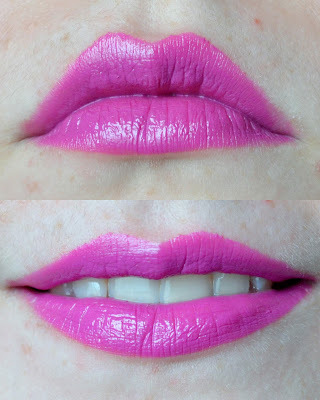 I adore this lipstick formula and the colour! It's bold, but so chic and versatile ❤︎ I think I will get lots and lots of wear out of it this Spring/Summer! If you're not fond of the Missha Glam Art Rouge Bless You in French Lavender, they have 19 other shades to chose from! Now let's move onto Missha Glam Flash Rouge - their newest product, called a lip fluid on their website. The shade I picked is PP01 Sick Heart - a pink-ish mauve. The packaging is as before - heavy and luxurious. 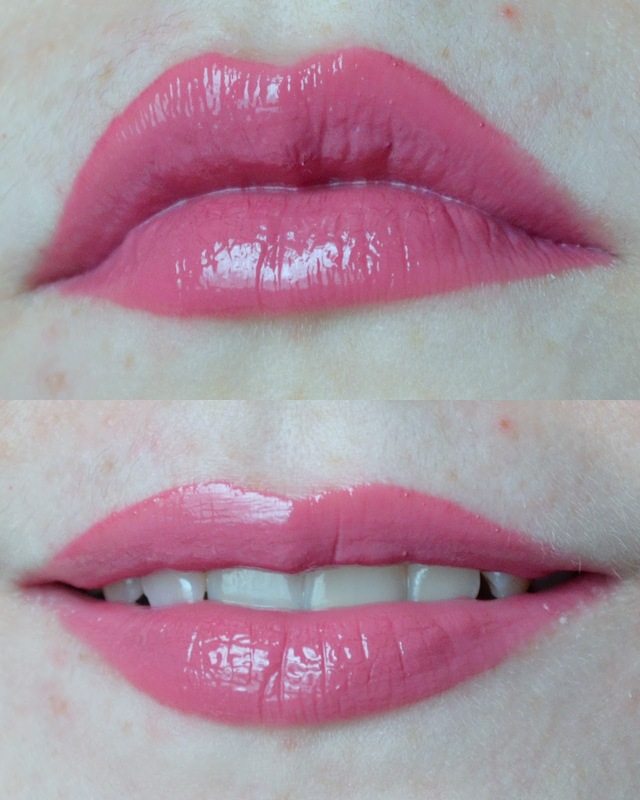 The cap looks the same as the Rouge Bless You lipstick, but the body that houses the actual lip fluid is clear. The colour you see in the tube is the colour you'll get - plain and simple. There is only Missha's brand engraved at the top of the cap, and the rest is left empty. Very minimalistic, yet extremely elegant! The applicator is different than what I'm used to - when I first pulled it out I thought that maybe it's faulty, since half of the doe-foot seemed to be missing. That is, however, by design - the plastic side of the applicator is for dispensing product and the doe-foot is for applying and blending it out. It works wonderfully that way - you can control exactly how intense you want the colour to be by either applying only what comes out on the doe-foot side, or dispensing more with the plastic side. It's not ground-breaking, but it is a very thoughtful touch considering the formula is almost pure pigment, so it gives you the much-needed control! As for the formula - it's creamy and thicker, but not tacky what-so-ever. It sits comfortably on the lips, providing a highly pigmented colour and moisture. 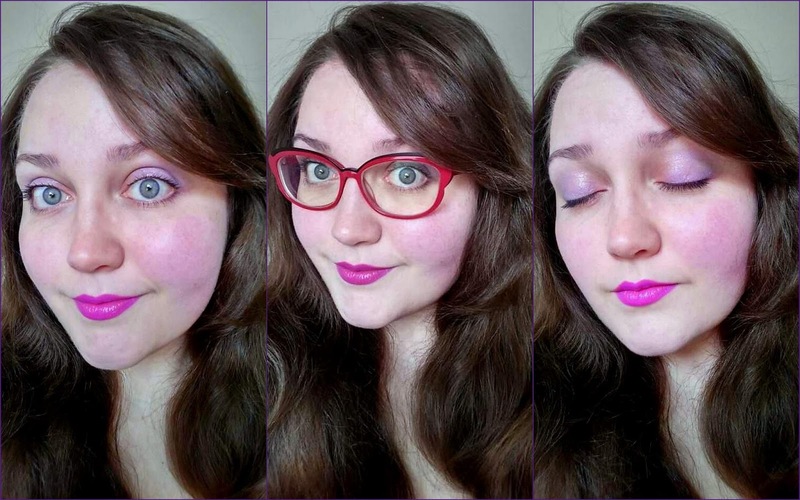 The swatches bellow show you just how much you can manipulate the intensity of the shade by using the two different applicators - quite a significant difference, if you ask me! On the lips it looks very smooth - majority of the lines will be filled without giving a heavy sensation and your pout will look plumper and almost Photoshoped. The shade is quite a neutral mauve, therefore I think it will suit various skin tones! It's a lovely shade for both day-to-day errands or a night out in the city, you just have to adjust the intensity. As with the Rouge Bless You lipstick, if you're not a fan of this Missha Glam Flash Rouge in Sick Heart, you have 9 other shades to chose from! 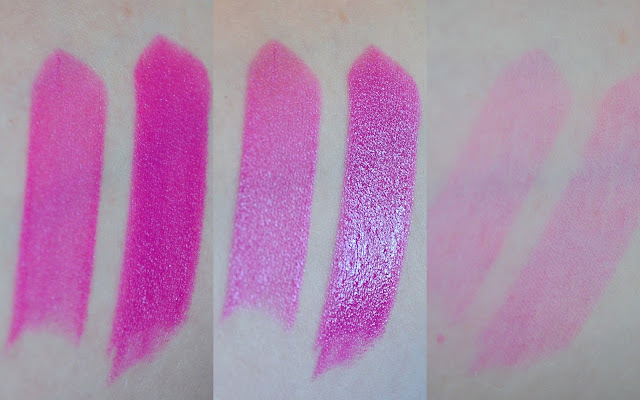 I have found both the Rouge Bless You in French Lavender and Glam Flash Rouge in Sick Heart on W2Beauty. com - I am not affiliated with the seller, but I have purchased from Alice before and she provides a fantastic service! The prices include shipping, so they're a tad higher than the Korean counterparts (still nothing when compared to expensive Western brands that they can easily compete in quality with). I say they are highly worth a try - pick a single shade, or a couple, but I am sure you will NOT be disappointed! Perhaps you've tried them already? What shades caught your eyes? Comment bellow!